An ancient tradition says: so that the weddings in the house do not end, so that the daughter is healthy, so that the joy is not interrupted – leave a small pattern on your suzani unfinished. As you already understood, suzani is not just a special part of Uzbek culture and art; this is an important element of the life of the whole nation. By tradition, suzanis are created by female hands. Ways of sewing and embroidery ornament passed from mother to her daughter. Decorative embroidery was created in each family. As a rule, it took one and a half to two years for the masters to do suzani. The dowry for the girls was prepared when they were still small. Mother and relatives embroidered beautiful items for the bride. Since ancient times, embroidered panels invariably present in every home. They decorated the walls, they served as a talisman. The main image of the Uzbek suzani is the plant world. The fantasy of embroiderers didn’t just turn into blooming fabric. In the riot of colors – the wish of happiness, well-being, symbols of fertility. In the Uzbek embroidery, the main role is played by color, but, despite the fact that in each individual suzani you can count up to fifteen tones, the craftswomen managed to preserve the harmony and unity of the overall color. Patterns in suzani are created for a reason, as each pattern is a symbol of something. So, for example, the firebird symbolizes happiness, the pepper pod is a powerful defense against dashing charms, and the pomegranate is a symbol of fertility. Men in suzani are denoted by cornflowers, and young girls by poppies. The most common motifs of oriental-style suzani ornaments include floral motifs: flowers (tulips, carnations, irises), trees, leaves and vines, images of birds and animals, as well as ancient symbols (such as the symbols of the sun and moon). Suzani are raised by hand, following the traditional compositions and colors, so each ornament is unique. The creation of each such work of art is divided into two main stages: first, the patterns are painted on the fabric, and only then proceed directly to the embroidery. As decorative embroidery, suzani in its artistic merit is not inferior to the carpet. The main suzani centers in Uzbekistan are Shakhrisabz, Bukhara, Samarkand, Khiva, Nurata, Urgut, Gijduvan, Fergana Valley. Patterns and ornaments of each region differ in details and color. Looking at the embroidered pattern, only true experts and connoisseurs of this type of art can easily determine in which region of Uzbekistan and for what reason the suzani was embroidered. Since ancient times, Nurata, Bukhara, Samarkand, Shakhrisabz, Tashkent and Fergana were considered centers of artistic embroidery. To this day, some scholars cannot find the exact answer from which such refinement of forms appeared in folk art. Indeed, at that time, only what was done for representatives of high society shone with grace. However, the delicate taste and special oriental charm are present in each of the embroidered panels. Each school of embroidery has its own unique story. And although the main image of Uzbek suzani is the plant world, if you try to find similarities between Bukhara and Fergana embroidery, you will not be able to do this. They are beautiful, and each of them is embroidered according to the clear traditions of its field. In this work of art there is a whole song about the ancient Uzbek land, about its people. For the wealth and diversity of floral motifs, the first place belongs, perhaps, to the Nurata’s suzani. Clear, bright features make it easy to distinguish them from products from other regions. On a white background – bouquets with blue, pink, gold, cream flowers and rosettes, figures of birds and animals, completely covering the fabric. If the suzane depicts a bright blooming garden and you can feel the unlimited flight of fantasy, you should know – it was created in Nurata. The Bukhara embroidery school has other features. The tambour stitch, which is used for most of the products, is its distinguishing feature. There are also elegant combinations of blue, lilac, gray, pink and light yellow tones. All this riot of colors successfully combined with other colors: red, crimson and green. If you carefully consider the suzani of Bukhara masters, you can see a lot of small details, together creating a whole composition. Folk craftswomen draw thousands of motives for their suzani from everyday life. But in Samarkand embroidery as the pattern is much larger and laconic, unlike the Nurata and Bukhara ornaments. In the center of the leafy ring is a round rosette of crimson shades. Susanis from yet another ancient city of the Samarkand region – Urgut shine with their unique beauty. 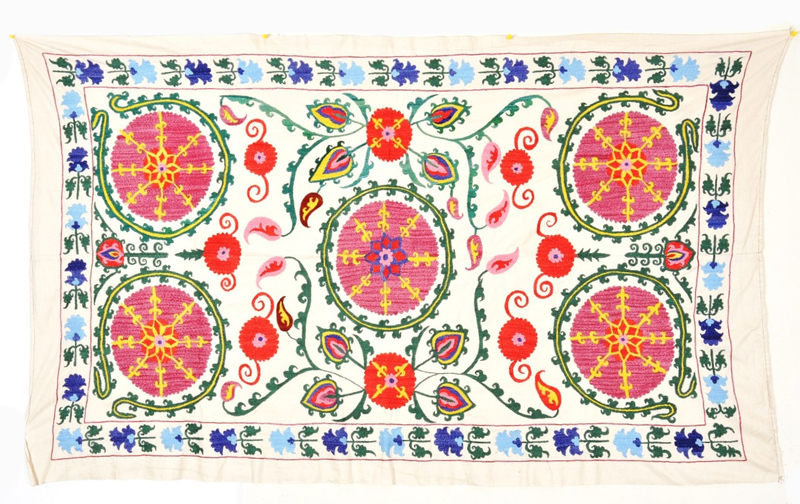 The embroidery of Urgut craftswomen is famous for its special stitch – “Bosma”. Panels created on white cotton fabric, less often on yellow or crimson silk, recreate the most ancient magical patterns and some details of everyday life. Bulky and dense embroidery on Urgut suzani almost completely covers the surface of the product. And small gaps of white fabric are an ideal background that emphasizes a bright ornament. The special expressiveness is distinguished by the embroidery of the masters of Shakhrisabz. It is made with chain stitch on a colored background. 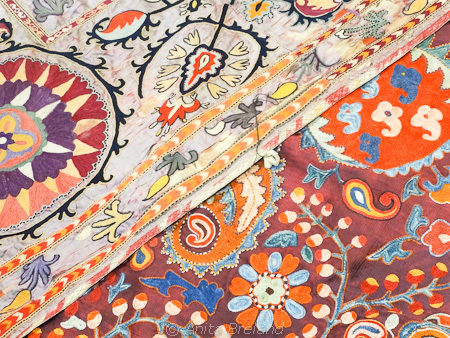 Suzani here resemble carpets more than embroidered panels. In their center a large medallion is often depicted, and in the corners there are quarters of the medallion. Looking at Shakhrisabz suzani, one can find out a strikingly clear pattern, sophistication and vivid contrast. Tashkent masters also have a peculiar and unique style. 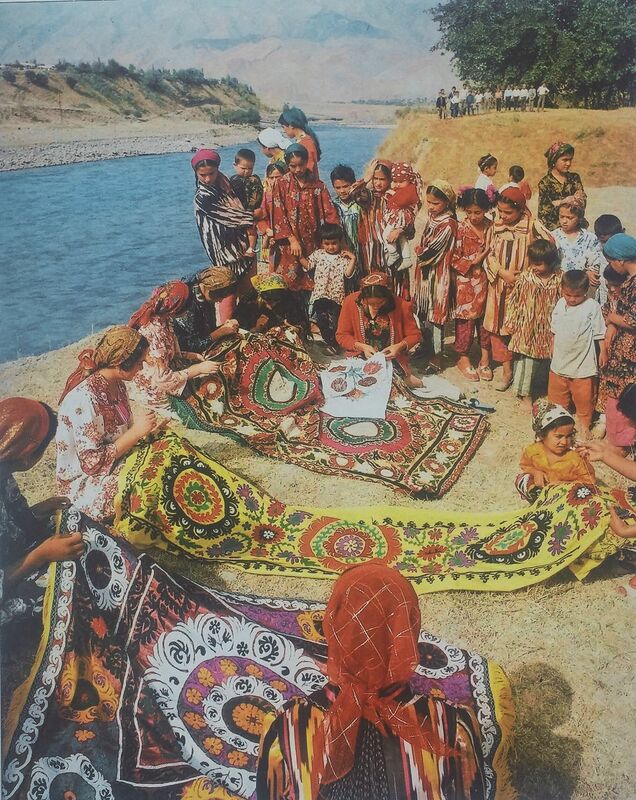 Since ancient times, there are two large types of decorative embroidery – palyak and gulkurpa. The main motive of palek (from the Arabic “fayak” – “sky”) is large dark red circles tightly filling the fabric. 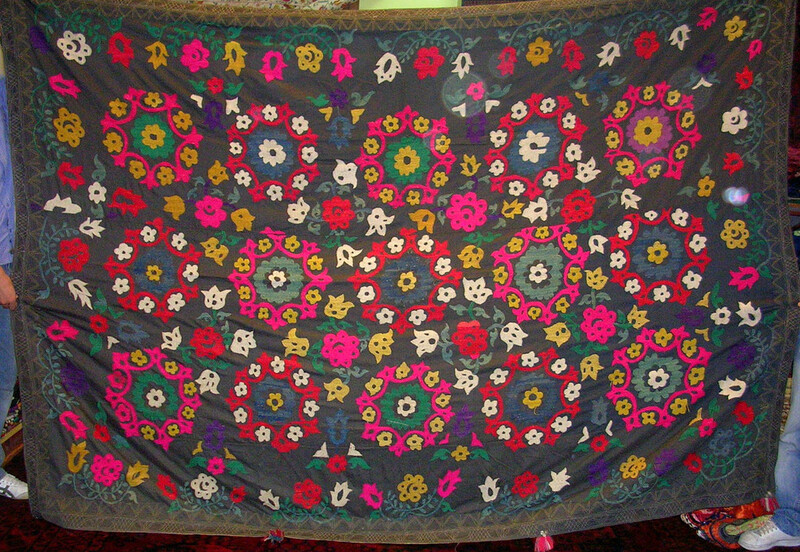 But gulkurpa (translated as “flower blanket”) served as a bedspread on the bed of the newlyweds. Bright flowering pattern was considered a symbol of a happy large family. Suzanis of the Fergana Valley cities of are made on purple or dark green silk or satin. They are distinguished by a special lightness of an elegant pattern that is freely placed on the background surface. This is mainly Ruijo embroidery, less often – large embroidery type gulkurpa. Flowing airiness and ease in the ornament refers to Fergana’s suzani. 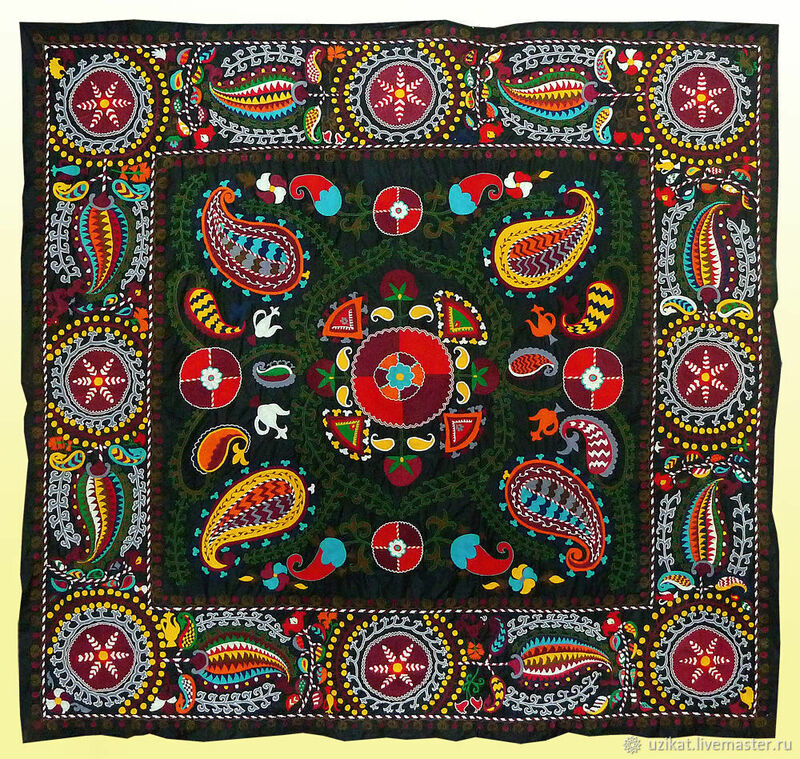 Hand embroidery is a whole branch on the tree of Uzbek folk art. The ancient mythological symbols of suzani ornaments, the limitless imagination of the craftswomen and the warmth of their hands, carefully creating this masterpiece – all this is not only a continuity of ancient traditions. This is the very poetic, delicate and sincere soul of the Uzbek people. This entry was posted in Hair + Beauty, Home + Decor, ikat fabric, Travel. Bookmark the permalink.